Click the button below to add the CRYSTAL MAGIC - Stone Crystallization Compound to your wish list. Crystal Magic is formulated to maintain and improve the polish of your Marble, Terrazzo and Travertine floors while enhancing the color and improving wear resistance. 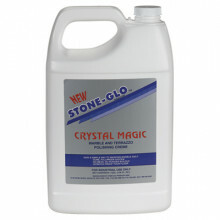 Crystal Magic will remove light scratches and enhance slip resistance. Crystal Magic reacts with the free carbonates in the stone through a chemical reaction catalyzed by the use of a steel wool pad. The resulting "cystallized" layer enhances the stones color and luster while increasing the stones resistance to wear and damage resulting from traffic and the elements.